A self-driving semi-tractor trailer has made its virgin journey across Colorado to deliver, what else, a load of beer. In partnership with Anheuser-Busch, self-driving truck maker Otto said the driver of its 18-wheeler spent most of the 120-mile journey from Fort Collins to Colorado Springs viewing the road from the sleeper berth. The truck hauled 51,744 cans of Budweiser down I-25 through downtown Denver on its way to Colorado Springs. 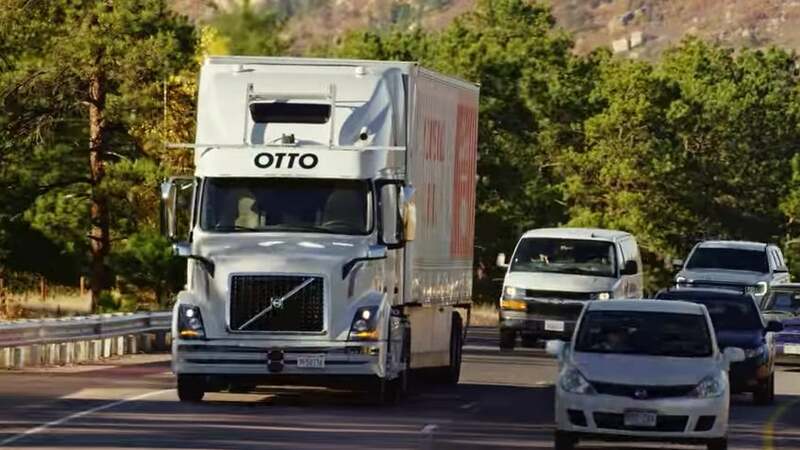 Otto claimed it was the world's first commercial shipment using a fully autonomous semi-trailer truck. Otto's driverless 18-wheeler in traffic on I-25. The truck was equipped with cameras, radar and laser sensors called LiDAR (Light Detection And Ranging) mounted on the vehicle to help it 'see' the road as it drove itself down the highway. "Otto's system controlled the acceleration, braking, and steering of the truck to carry the beer exit-to-exit without any human intervention," the company stated in a blog. "In fact, our professional driver was out of the driver's seat for the entire 120-mile journey down I-25." Last year, Daimler Trucks unveiled what it said was the world's first licensed 18-wheel semi-tractor trailer that can drive itself. Daimler's Freightliner Inspiration Truck, a concept vehicle, underwent extensive testing, the company said, before the Nevada Department of Motor Vehicles granted it a license to operate on public roads in the state. This year, the truck was driven more than 10,000 miles during a test in Germany. Otto's said its truck's first commercial shipment was the next step towards a vision for "a safe and productive future across our highways." "With an Otto-equipped vehicle, truck drivers will have the opportunity to rest during long stretches of highway while the truck continues to drive and make money for them," the company stated. "When you'll see a truck driving down the road with nobody in the front seat, you'll know that it's highly unlikely to get into a collision, drive aggressively, or waste a single drop of fuel."